Stamped concrete is a strong, durable, and long-lasting concrete slab that incorporates decorative elements. The process involves combining color with the concrete and imprinting it with a textured pattern while it is still in its plastic state. 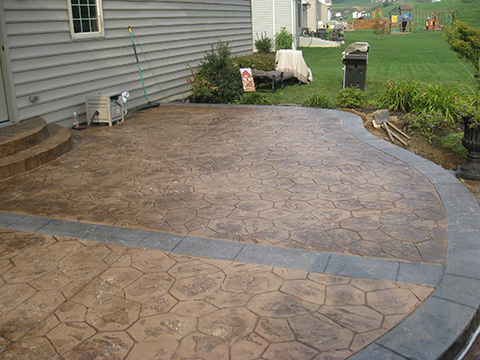 Stamped concrete is very popular among homeowners, and is often used for driveways, patios, porches, and sidewalks. Stamped concrete is also used widely in the commercial market on the interior and exterior of restaurants, malls, and hotels. Keith D. Smith Concrete was one of the first in the region to offer stamped concrete. We are masters of this craft and complete an average of 30-40 stamped concrete projects a year. We also have a vast selection of stamp patterns, textures, and colors for our clients to choose from. We also offer our clients design help with colors, patterns, and borders prior to the start of the project to ensure their project is unique and fits well within its surroundings. Solomon Liquid Pigment – Concrete Base Color: This liquid color is the base color for your stamped concrete project. It mixes consistently throughout to produce consistent color throughout the slab.